PCS have recently received the order from BAM Construction for the new school redevelopment at the Bishop of Rochester Academy. The project requires the construction of four new buildings on the current school site. With the use of multiple gangs and cranes, PCS have achieved a total build programme of just 13 weeks for all four buildings. The ï¿?.3m project involves the design, supply and erection of a combination of precast concrete products. The design includes precast walls, columns and Delta Beams, precast staircases, hollowcore flooring and an external facade which comprises brickwork faced load bearing composite panels. PCS and our partners Thorp Precast have worked in close liaison with the architects (Nicholas Hare LLP) to develop and enhance the buildings merits and value engineer the programme. — Visualisations by: Virtual Planit. PCS have been successful in the competitive bid for the design, manufacture and erection of the architectural precast concrete features of the project at Crown woods School, Greenwich. Balfour Beatty were awarded the ï¿?00 million Greenwich Schools Building Schools for the Future (BSF) construction partner contract by VT Group. The Greenwich BSF contract is a design and build contract for two schools, Thomas Tallis and Crown Woods, the latter is a 1,800 pupil secondary school to be split into three colleges, two for mixed ability pupils and one for gifted and talented pupils, occupation of Crown Wood is expected in April 2011. The building of the new College has progressed extremely well and Balfour Beatty has reported that the construction is 3 weeks ahead of schedule. There are nine separate buildings on the site, all at an advanced stage of construction. PCS are supplying and erecting 50 precast canopy units, each weighing 9.3 tonnes, along with 116 precast columns supporting these units. All are special units cast in white concrete, then acid etched to providing a contrast to the new nine buildings. Erection is complicated by access being limited to the rear of the buildings only, thus requiring the needs of a 200 tonne crane to facilitate lifting of the precast over the now complete three storey structures. 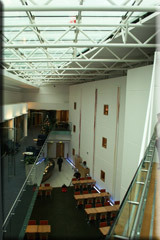 The project required a complete design, manufacture and erection of key architectural features. The project had a tight tender period and also a very quick turnaround from order to delivery on site – this was achieved within ten weeks. The Police Federation of England and Wales which represents 140,000 police officers, Sergeants, Inspectors and Chief Inspectors commissioned a new Headquarters building in Leatherhead, Surrey. The £13m project, which is designed around a central atrium to maximise natural light, brought a number of different uses under one roof, providing the Federation head office, a training and development centre with meeting rooms and a 55 bedroom accommodation wing. The PCS engineered solution used a number of different precast components including Beam and Column sections along with the typical PCS high quality twin wall elements which were suitable for direct decoration on both sides, obviating the need for plaster finishes. 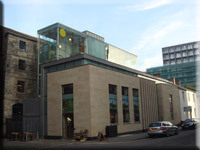 The listed Carvers Warehouse is the oldest surviving and only stone built warehouse remaining in Manchester City centre having been completed in 1804 and in recent times had been the home of a bathroom showroom. Yorkshire based Town Centre Securities developed a restoration scheme to restore the warehouse as part of their £250m Piccadilly Basin development, retaining virtually all the original timber and cast iron structure, and converting it to office use. Included with the restoration work was a contemporary extension. The design of this new build section is based on high quality precast concrete sections with exposed internal walls and soffits linking through a glass facade system to the historic warehouse. Martin Stockley Associates, the Consulting Engineers and Principal Contractor for the development, have moved their offices into top two floors of the restored warehouse. News International, publishers of The Times, The Sunday Times, The Sun and News of the World, undertook a redevelopment of its printing facilities on 3 sites, Broxbourne, Liverpool and Glasgow. The largest of these sites was a new 27,250 square meter development at Broxbourne near the M25. PCS was awarded the contract to construct a 4 hour fire wall to separate the paper store from the printing facilities. The wall was in excess of 245m long and 25m high formed from 200mm thick autoclave concrete panels. Carillion achieved a Gold Award under the Considerate Contractors Scheme for the development. Precast Structures Ltd have been awarded the design, supply, erection and construction of the precast concrete frame for the new student accommodation project at Adam Street Fire station site in Cardiff. PCS have received the order from Vinci construction after close liaison with the main contractor and architect (Morgan Hayman) at design concept stages. The project involves the design supply and erection of three blocks varying from three to nine storeys in height which will provide a total of 540 beds. The £3m order will be completed over a total programme of 32 weeks. PCS design utilised a combination of twin wall panels, (which are half the weight of solid concrete panel sections), solid room sized concrete floor slabs, precast hollowcore floor units and precast concrete staircases combined with lightweight steel external wall infill cassettes in line with the Precast ethos that the best design solution is the combination of the right material for the individual project build. The choice of materials is designed to reduce wet trades and allows a direct application of paint in key areas – i.e. walls and ceilings in the bedroom units. The scheme exhibits all the benefits of using a composite precast solution using a single structural supply. With growing student numbers Brunel University in Uxbridge decided to expand its en-suite student accommodation on its West London Central campus by 1,400 units. The £56 million project was a design and build development with Norwest Holst. The primary structure of the buildings is precast concrete twin walls and floor units, which provide a rapid construction process and allow an early start for secondary trades. The Architect’s design consisted of 17 similar shaped, 5 storey buildings each with two wings around a central lift and stair core zone. Each building contains 80 to 100 rooms, each one fitted with a toilet-shower pod and access to shared kitchen facilities. The project started on site in November 2006 with piling and foundations. The precast erection commenced in April 2007 with completion of all 17 blocks and two additional buildings by December 2007, four months ahead of the contract programme. PCS continues with another successful year having recently secured an order from Willmott Dixon Housing (Shefford), in association with Glen Howells Architects (Birmingham) for their new site at Parkside Place, Cambridge. The development comprises of four new apartment buildings, varying from three to eight storeys in height, PCS have designed a precast concrete frame solution utilising a combination of twin wall, load bearing internal precast walls, hollowcore flooring and precast staircases. The structural package also includes an architectural precast facade of composite panels comprising of an inner skin of precast, insulation layer and an outer skin of Portland Buff colour acid etched concrete. The project is a re development of the old fire station site, the new build includes a new replacement facility, and continues the local area redevelopment plan. This £4m order for PCS will be complete in a programme over 25 weeks and continues our recent success in social housing and education markets, expanding our success in the core areas of hotels and student accommodation for which we are renowned. PCS have recently received the order for the, design, manufacture and erection of the precast frame of Block Q Portishead, from Vinci Construction acting on behalf of Crest Nicholson. This is the second significant project that PCS have worked in conjunction with Stride Treglowan Architects. As designed the project has an insitu transfer slab at level one, over a ground floor car park. Above this PCS have designed a six storey block with a total of 94 apartments. These apartments are a mix of Private open market and Housing Association. The project combines the benefits of precast hollowcore floors, solid Crosswalls and precast staircases. This combination of; prefabricated units allow lateral restraint, diaphragm action, and progressive collapse design, to be fully integrated in a simple, yet effective design solution. 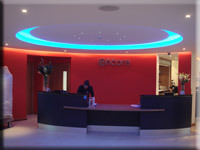 Vinci Contractors begin on site in January 2011, with PCs starting in April with a planned 13 week programme. As can be seen from the architects visualisation drawings, the completed structure will provide a stunning backdrop to the harbour. 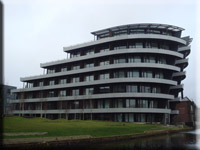 This design of a truly magnificent site at Port Marine has been delicately handled to respect the urban grain and diversity of Portishead alongside the urban design and commercial strategy of a high quality, high profile modern development culminating in a master plan of great depth and sustainability. Pioneering developer Urban Splash teamed up with one of the UK’s leading Architects, Foster and Partners to develop an environmentally sustainable, residential scheme on the banks of Bridgewater Canal in Altrincham, incorporating a number of innovative features. The development is on a brownfield site which was the home of the Budenberg Gauge works between 1914 and 2002, a company which manufactured pressure gauges used for a variety of applications, including aircraft and steam locomotives. The two new buildings on site rise from 3 stories, adjacent to the existing buildings, up to 10 stories which cantilever out over the canal with a large private garden area between them. The PCS involvement included high quality precast floor units forming the ceilings of the floors below along with stair and lift towers. In some areas the exposed soffits of the floor units are curved to provide feature ceilings. The Hub is a 10 storey ‘U’ shaped development, wrapped around a hard landscaped plaza, of 167 new apartments in the heart of a Manchester mixed use development area, by Argent Group in Manchester City centre. The building structure is formed entirely from precast elements, which has led to each floor level being erected and clad within a 4 week period. Architectural sandwich cladding panels, Precast stairs, Twin wall, Solid wall, Hollow-core planks, Solid wall lift shafts. PCS have received the order for the, design, manufacture and erection of the precast frame. The hotel has a total of 98 rooms over 6 floors. The design encompasses a ground floor transfer deck of steel and metaldeck flooring. This design gives the benefits of an open and light reception area, lobby, kitchen and a retail development area. The project combines the benefits of precast hollowcore floors, complete room size solid floors, twinwall, and precast staircases along with lightweight metal framing. This unique combination of prefabricated units will allow lateral restraint, diaphragm action, and progressive collapse design, to be fully integrated in a simple, yet effective design solution. The main contractor, Metnor Construction began on site in September 2010, with PCs starting in February 2011 with a planned 13 week programme. Sleeperz is targeting an opening date of October 2011. PCS have worked in close alliance with the a Archial Architects to carry forward the clients ethos for the Sleeperz concept and design visualisation. Sleeperz Hotels Chief Executive David Myers described the ï¿?m investment in the company that will help fund the building of the Newcastle project as “a major endorsement in the Sleeperz proposition of compact lifestyle hotels in prime city centre locations offering great value for money.” He also added, “There are so many positives in the Sleeperz brand. Not only have we managed to buck the trend in an increasingly challenging market – but in sticking to our ideals of convenience, value and style, are now driving on to growth and expansion. Sleeperz brings something new and exciting to the market and, with the backing of major investors, we are here for the future. The new £8m Ramada Encore Warrington, located on Birchwood Business Park, is a new hotel with a simple concept of being fresh, stylish vibrant and upbeat whilst offering comfortable contemporary accommodation. This hotel located near Warrington town centre provides 103 ensuite bedrooms, and 2 meeting rooms over 4 stories, with all public areas and bedrooms being fully air-conditioned. The structure was erected by PCs within 9 weeks using twin wall precast wall panels which were manufactured to provide a wall ready to accept minimal painting to achieve finishes with a great appearance. PCS worked closely with Skanska Construction in the tender process, and have secured the order for the precast concrete houseblocks for HMP Grampian on behalf of The Scottish Prison service. The site is near to the current HMP at Peterhead. 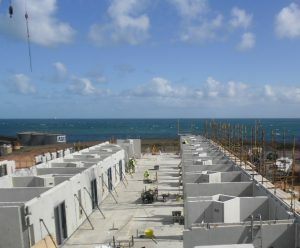 The total order value of £7m covers the design, manufacture and erection of 3 houseblocks (each one comprises of 4 stories in height and a total of 500 bed accommodations). The PCS/Skanska design also incorporated precast solutions to the Gatehouse and Prisoner Services Buildings. The PCS design offered a combination of both vertically and flat cast walls between 100mm, and 175 mm thick, with where required windows/ bars, cell door frames cast into the wall panels at our factory. Floor solutions including pre finished solid concrete floor slabs to cell areas (incorporating services cast in for lighting, under floor heating and drainage for shower units), and hollowcore floor slabs to communal areas. The PCS package included also the Precast concrete Stairs, landings and supporting embedded structural steelwork. PCS in conjunction with Skanska put forward an alternative to adopt services designed for precast walls to ensure accuracy on placement, quality of finish and ease of manufacture. The contractor was also offered solutions of Reconstituted Stone block “look alike” sandwich panels (in polished and natural finishes) to resolve possible weather problems encountered in winter working. The PCS solution incorporated the perimeter walls and Houseblock Number One exercise yard walls, these are “Grey” concrete precast walls, which taper from 450mm thick at the base to 150mm thick at the top of the wall. The final construction programme entailed the commitment of up to 4 gangs and 4 crawler cranes over a period of 26 weeks. The PCS phase of the project is close to completion and has been extremely successful partnership between PCS and Skanska for custodial supply. 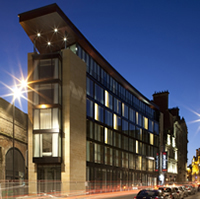 PCS remains one of the UK market leaders in the design and manufacture of precast concrete design solutions for the apartment, hotel, student and custodial accommodation projects. As part of the MOD’s wider Project MoDEL works at RAF Northolt, Precast Concrete Structures Ltd have successfully completed the erection of 2 x junior ranks, ‘barrack blocks’ for Norwest Holst Ltd. The project, completed to programme and budget, provides single living accommodation for some 182 airmen and airwomen at this prestigious West London unit. The development consists of two interlocking, ‘T’ shaped, 3 storey blocks with en-suite accommodation and communal lounge areas on each floor. The high quality PCS wall panels and floor slabs were manufactured to permit direct decoration, thereby removing the need for following wet trades. Although the project sits outside the realms of the MOD’s Project SLAM (Single Living Accommodation Modernisation) it has been erected to similar standards and dimensions and has the potential to set the standard for future accommodation requirements at RAF Northolt. Precast Concrete Structures Ltd have an excellent appreciation of the MOD’s and Defence Estates accommodation needs and with security cleared operatives, are well placed to carry out similar accommodation work across the MOD Estate in the future.